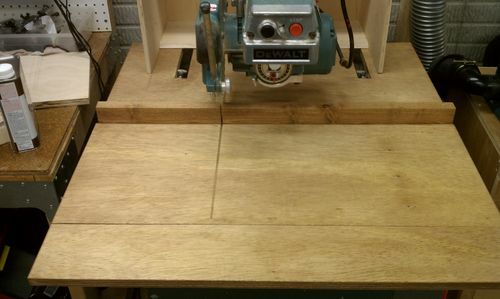 Anyway, the point of this first blog entry was to showcase the new top I put on the radial arm saw I inherited from my Grandpa. Until today I have used it as received but realized that the top was pretty chewed up and if I wanted to clean cuts without chip out I needed to start with a clean slate. I used 3/4” hardwood ply and a 1.5” jointed ash fence. I also extended it deeper, behind the post than the original to make it easier to attach a dust collection hood (in progress). After replacing the top, I tuned it up and now get beautiful cross cuts. I haven’t messed around with 45 degree cuts or bevel cuts but with my table saw and some jigs, I may dedicate this for cross cuts for now. Looks good. I am glad you were able to restore old machinery…much better made than new stuff. My bro in law ‘borrowed’ my dad’s RAS over 20 yrs ago while I was away in university. He left it uncovered under a deck and it warped the top and rusted it to hell. I had my eyes on it since I was able to walk. Maybe I should go over and re-borrow it and start a renovation project of my own. yeah I was pretty fortunate to get this. 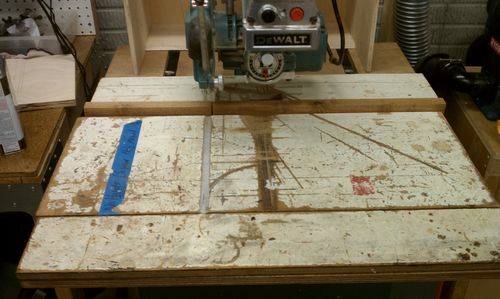 Aside from the table top, it was in outstanding shape I really didn’t need to do anything other than align it. nice table. have you considered a sacrificial top for it so you don’t wear it out? Maybe you already have it and I just can’t see it from the pictures. I like the dust collection at the back. Hand me down tool are the greatest !! Great job on the new table John. These tools must last forever. I recall my brother talking about them back in 1950 about how amazing and versatile they were. It seems there are still many RAS fans out there. Maybe you will be handing down yourself some day.